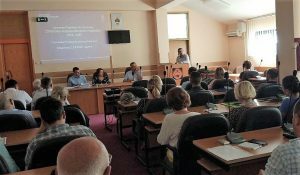 On August 23, 2018, in the premises of Gradiška Municipality, a meeting of the local Partnership for Development was held, where the Strategic platform for the development of the municipality in the period 2019-2027 was discussed. After plenary work, members of the Partnership, which include numerous representatives of the civil society (NGOs and the private sector) and the public sector (representatives of municipal administration and public enterprises), continued their work in sectoral groups – (i) for economic development, (ii) for social development and (iii) for the environment protection. Sectoral groups carried out an initial determination of the focus and objectives of sectoral plans for the period 2019-2027. These activities were implemented as part of the process of design of the integrated Development Strategy of the Municipality of Gradiška for the period 2019-2027, and they are supported by the Local Integrated Development Project – LIR, implemented by the United Nations Development Program – UNDP. The technical assistance and training services for the local development team during the process of design of this important strategic document is provided by the Eda team.